Las Brisas 302, Oceanfront, 3 Bedroom, 2 Bath, Sleeps 9, 20 STEPS TO BEACH! 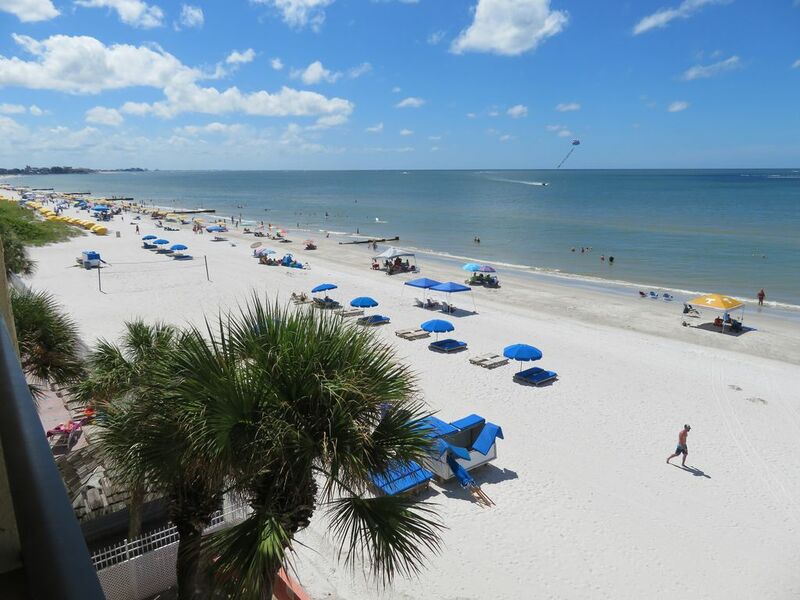 Our Las Brisas three bedroom/two bath condominium rental is among the larger units available in the Tampa-St. Pete-Clearwater Beach area. It is easy to get to from area airports and is 30 minutes from Tampa International with Clearwater Beach to the north and St. Petersburg Beach to the south. The condo has 2 covered and reserved parking spaces. It is a short hike to St. John's Pass, a popular destination with many restaurants, fishing charters, parasailing, waverunner rentals, and an old fashioned boardwalk lined with interesting shops. The beach is famous for its soft sugar sand and year-round near perfect weather. Numerous attractions are nearby including great golf, Busch Gardens (30 minutes), Disney World (90 minutes), Tampa Aquarium, planetarium, art museums, live theatre, and plenty of water sports, rentals, and activities within minutes. Not to mention miles of open beaches and the Gulf of Mexico right at your feet. Las Brisas is a modern, five-story, 40-unit condominium with under-building private parking, easy access, elevator service, a beachside heated swimming pool, Tiki Hut lounge areas with outdoor grills, and a fabulous beach. For larger family gatherings, we have access to several units in this building. We are a family from Dayton, Ohio that absolutely love Madeira Beach, so we recently purchased this condo for our family to vacation. Since we obviously can't use it every week, we are hoping that other families are able to use it and enjoy it as much as we do! You will enjoy outstanding views from the living room, kitchen, Master Bedroom and of course on the balcony that spans the width of the unit. While your staying be sure to stop by John's Pass, eat at some of the best seafood restaurants and take some time to enjoy some of the amusement parks that are within 1-2 hours away. Our condo sits right over the sandy beach with nothing but the horizon and endless ocean for a view. Central Air and Heat throughout. Two private assigned parking spaces under building. Nice and spacious 3-bedroom 2-bathroom condo directly on the beach! This condo is fully furnished down to the towels and silverware, and has 2 covered and reserved parking spaces. All modern electric kitchen with new appliances. Fully equipped for large meals. Time-Warner Cable TV /VCR/DVD in Family Room and Bedrooms. Some beach toys in laundry room. Balcony spans entire western end of unit with sliders to master bedroom and living room. The entire apartment and balcony overlooks the ocean with unobstructed view all the way to Mexico! Sundeck with lounge chairs surrounds the pool area. 2nd sundeck at opposite end of building for quiet reading/sunning. Easy access from parking lot to elevator to unit. Heated Pool Directly on the beach - for residents of building only.